OAKLAND, Calif. (AP) — Stephen Curry and the Golden State Warriors certainly looked ready to trade some more blows with LeBron James and the Cleveland Cavaliers come June. The two-time reigning MVP hit five 3-pointers and had 20 points while matching his season best with 11 assists in Golden State’s 126-91 rout of the defending champs Monday. Klay Thompson scored 26 points with five 3s, and Draymond Green produced his third triple-double of the season with 11 points, 13 rebounds and 11 assists. He also equaled his career best with five blocks — and had another dustup with King James in the process. The Warriors squandered a 14-point lead that day in a loss that fueled them going into Monday. They relinquished a 3-1 advantage in the NBA Finals last year, a failure that motivates them to return to the big stage. And the rivals’ latest holiday game marked the Cavs’ first trip back to Oracle Arena since capturing the title here seven months ago. Kyrie Irving — who hit game-winners against Golden State in the past two matchups, including the championship clincher — scored 17 points on an uncharacteristic day for the Cavs when they committed 15 turnovers to 11 assists. The latest altercation between Green and James came with 6:55 left in the first half. Golden State led 52-35 when James collided with Green near midcourt, resulting in a flagrant 1 foul on Golden State’s emotional All-Star. Green’s arm extended across the upper body of James, who went down hard and lay on the court. Green reacted by appearing to mock James for flopping — and he wasn’t the only one to sense some embellishment from LeBron. “Flagrant 1 on Draymond?? What has happened to my league? ?” former player-turned-analyst Reggie Miller posted on Twitter. This tension goes back a while: Green was suspended for Game 5 of last season’s NBA Finals after swiping at James’ groin the previous game. The absence of Green helped swing the series. After Curry’s pull-up 3 moments before halftime Monday sent his team into the break with a 78-49 lead, the star guard did what looked like a little celebratory breakdancing move on his behind at the sideline. 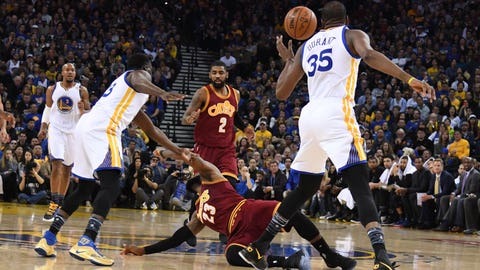 A day after the Christmas loss at Cleveland last month, the NBA said James should have received a technical for hanging on the rim with 1:43 to play and that Jefferson fouled Durant on the game’s final play. That prompted Durant to call on the league to ditch the Last Two Minute Report altogether. On Monday, Durant appeared downright possessed. KD’s driving, emphatic tomahawk jam 1:43 before halftime sent Oracle Arena’s sellout crowd into a frenzy. Cavaliers: Cleveland, second in the NBA in 3-pointers (496) coming in and third in 3-point percentage (.385), shot 2 for 12 from behind the arc in the first quarter and had just one assist in the period. The Cavs were 9 of 34 from long range overall. … Korver played in his 1,000th career game. Warriors: Curry made four steals. … Golden State had 24 assists to Cleveland’s four in the first half. … Curry hit a 3 in his 100th straight home game, the second-longest such streak in NBA history behind Korver’s 132. … Golden State is 7-0 at home vs. the Eastern Conference and 13-1 overall, with that lone loss to the Cavs. … Iguodala had his career-best streak of five straight games without a turnover snapped with one miscue, while dishing out five more assists for 22 during this span. … MC Hammer was in the house.